Have a favorite restaurant or bar you love around Baltimore? Each wood panel is hand-painted on by Artist Linda Amtmann and include classic landmarks and icons in Baltimore like the Baltimore Seafood House, Maryland Seafood, Ravens House, Orioles House, Domino Sugar Plant, John's Hopkins Hospital, Patterson Park Pagoda, and Natty Boh Tower. These are painted on tongue & grove floor boards. Collect more than one and they interlock to create your own neighborhood. Each wood panel is sold individually. 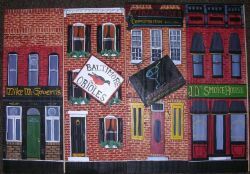 Baltimore Rowhouse Hand Painted on wood by artist Linda Amtmann. Height size varies. Approximately 14"x5"x3/4"
Each wood panel is sold individually. Wood panels are available in various choices including the Baltimore Seafood House, Maryland Seafood, Ravens House, Orioles House, Domino Sugar Plant, John's Hopkins Hospital, Patterson Park Pagoda, and Natty Boh Tower. If Gift Wrap desired, please note in Comments during Checkout. then click "ADD TO CART" button (to the right of the Price).